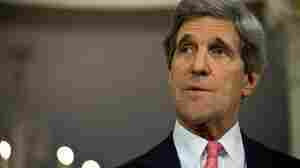 February 27, 2013  Secretary of State Kerry is in Rome for a meeting on Thursday with the leaders of Syria's opposition coalition. Ahead of the session, there are indications the U.S. is prepared to provide some direct aid to the coalition, including military hardware such as body armor and armored vehicles. The European Union is discussing similar aid. February 26, 2013  As John Kerry undertakes his first foreign trip as Secretary of State, the challenges before him are great — especially the war in Syria. He holds a town hall meeting Tuesday in Berlin, which will give us a look at his style and public-diplomacy skills — areas where his predecessor Hillary Clinton excelled. February 24, 2013  One dominant theme of the trip will be how to resolve the crisis in Syria, where an estimated 70,000 people have been killed over the past two years. Kerry is portraying his first trip as secretary of state as a listening tour, and he certainly expects to hear a lot about Syria. February 20, 2013  Secretary of State John Kerry gave his first major foreign policy speech Wednesday at the University of Virginia. His comments come days before he leaves on his first trip as America's top diplomat. He's traveling to Europe and the Middle East. February 19, 2013  Russia is prosecuting a dead man, corruption whistle-blower Sergei Magnitsky, in a case that has severely complicated U.S.-Russia relations. Congress passed a bill that will punish anyone involved in the Magnitsky case and other major human rights violators in Russia. The Russian parliament responded by banning adoptions by American families of Russian children. It is against this backdrop that the new Secretary of State John Kerry finds himself searching for ways to reset relations once again. February 16, 2013  As President Obama continues to reduce the U.S. troop presence in Afghanistan, some Afghans say they are going to need his help now more than ever. Human rights activists are worried that the government in Afghanistan may be too weak to deal with dramatic changes expected in the next year: the drawdown of U.S. troops, efforts to negotiate peace with the Taliban and elections. February 5, 2013  The attack at a Black Sea resort town last July killed five Israeli tourists and one Bulgarian citizen. In response, the White House called Hezbollah, the Lebanese militant group, a "real and growing threat not only to Europe, but to the rest of the world." February 1, 2013  Friday was Hillary Clinton's final day at the State Department. As her staff bid farewell, many analysts are wondering what kind of lasting impact she's had on U.S. foreign policy. In an interview, Clinton says it was important for the U.S. to "again assume a leadership position that was in concert with our values." She says she helped repair frayed alliances and brought some longer term issues to the forefront including the role of women, climate change and Internet freedoms. "There is nothing fast or easy about diplomacy," she says. January 29, 2013  Secretary of State Hillary Clinton had been hoping to take an around the world trip as she wraps up her time as secretary of state. But recent health troubles grounded her. Instead she bid farewell by taking questions from around the world in a "Global Townterview" at the Newseum on Tuesday. January 25, 2013  Secretary of State-designate John Kerry has suggested that the Obama administration will make a new push for peace between Israel and the Palestinians. January 24, 2013  Sen. John Kerry appeared before fellow members of his Senate Foreign Relations Committee for his confirmation hearing as the next secretary of state on Thursday. January 24, 2013  On Wednesday, Secretary of State Hillary Clinton gave emotional and at times angry testimony about the attack that killed the U.S. ambassador to Libya and three other Americans last September. She says the U.S. needs a strategy to deal with what she calls a spreading jihadist threat in a new political landscape. January 23, 2013  Secretary of State Hillary Clinton testified before Congress about the events surrounding the Sept. 11 consulate attack in Benghazi, Libya. The U.S. ambassador to Libya and three other Americans were killed in the attack.